Hanshaw, Armand E., head-of-household, age 28, born in Wisconsin; parents born in Wisconsin; first married at age 23; owned home ($10,000 value); radio in home; occupation: purchasing agent, stove co.; not a veteran. Hanshaw, Deborah, wife, age 27, born in Illinois; parents born in Illinois; first married at age 23. Hanshaw, Allen, son, age 3 years 9 months, born in Illinois; father born in Wisconsin; mother born in Illinois. Hanshaw, Sally, daughter, age 3 months, born in Illinois; father born in Wisconsin; mother born in Illinois. LaBounty, Marie, maid, age 18, born in Iowa; father born in Illinois; mother born in Iowa; single; occupation: housework, private home. Deborah Ahlvin of Tucson, Ariz. will celebrate her 100th birthday with a family gathering/reunion luncheon April 27 at Doubletree Guest Suites in Tucson, Ariz. The event will be hosted by her children: Alan and Emma Hanshaw of Tucson, Ariz.; and Sally Hanshaw Watson of Crystal Lake. One son, Wallis Hanshaw, is deceased. She has nine grandchildren and 19 great-grandchildren. The former Deborah Sanborn was born April 30, 1902 in Streator. Her husband, Dr. Reno Ahlvin, a former local pediatrician, is deceased. Her father, W.R. Sanborn, founded Lehigh Stone Company. Mrs. Alvin was a past president of the YWCA, a member of the Eastern Star, D.A.R. and Church Guild. She enjoys needlework, playing bridge and doing crossword puzzles. Cards and good wishes may be sent to her at 2250 N. Rosemont Blvd. #259A, Tucson, Ariz. 85712. Deborah Sanborn Hanshaw Ahlvin died a peaceful death in the home of her son and daughter-in-law on September 24, 2004, at the age of 102. 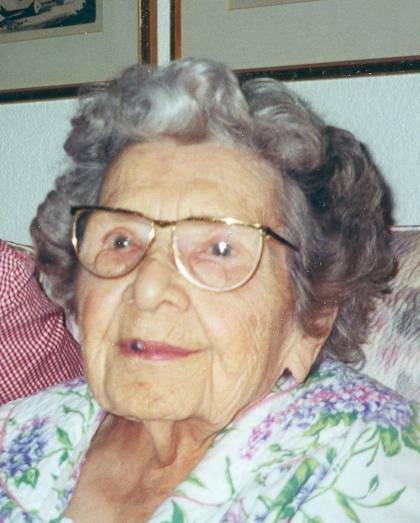 She was predeceased by her parents, three siblings, son, Wallis, and her husband, Dr. Reno Ahlvin and survived by her son and daughter-in-law, Alan and Emma Hanshaw; daughter, Sally Hanshaw Wilson; stepson, Dr. Reno Ahlvin, Jr.; nine grandchildren, 19 great-grandchildren and nieces and nephews. Deborah was a native of Illinois, having lived in Kankakee most of her life before moving to Arizona 30 years ago with her husband. A graduate of the University of Wisconsin, she taught school before her marriage to Armand E. Hanshaw. Very active in community affairs, she was a volunteer nurse's aide during WWII, a member of the D.A.R., O.E.S., a literary club, and served as president of the YWCA. During her tenure a new "Y" was constructed. Her interests were many, but her greatest love was her grandchildren and great-grandchildren, whose birthdays she never forgot. We were all truly blessed to have had her in our lives in such an active family role. Funeral and burial services were held in Kankakee, Illinois on October 2, 2004. A memorial service will be held in Tucson at 4:00 p.m. on Saturday, October 9, 2004, at Grace St. Paul's Church, 2331 Adams Street, 85719. Remembrances may be sent to Grace St. Paul's Church, to Carondelet Hospice Services, 1802 West St. Mary's Road, Tucson, Arizona 85745, or to the charity of your choice. Arrangements by ADAIR FUNERAL HOME, Dodge Chapel. Deborah Sanborn Ahlvin, 102, of Tucson, Ariz., formerly of Kankakee, died Friday (Sept. 24, 2004) at her son's home in Tucson. Visitation will be from 11 a.m. Saturday until the noon services at St. Paul's Episcopal Church, Kankakee, where she was a member. Burial will be in Kankakee Memorial Gardens. In lieu of flowers, memorial donations may be made to St. Paul's Episcopal Church. Kankakee Chapel of the Schreffler Funeral Homes is in charge of arrangements. Mrs. Ahlvin taught Home Economics for a short time at Reddick High School. She was born April 30, 1902, in Streator, the daughter of W.R. and Ada Carmony Sanborn. Her father was the founder and president of Lehigh Stone Company. Her husband, Reno Ahlvin, a Kankakee pediatrician, whom she married Feb. 14, 1954, in Kankakee, died March 6, 1979. Surviving are one son and daughter-in-law, Alan and Emma Hanshaw of Tucson, Ariz.; one daughter, Sally Watson of Crystal Lake; nine grandchildren, Pamela (Watson) Erickson of Crystal Lake, Andrea (Watson) Lynch of Palatine, Cynthia (Watson) Veronda of Kankakee, Rebecca (Watson) VanItallie of Clarkston, Mich., Mark Hanshaw of Tucson, Ariz., John Hanshaw of Draper, Utah, David Hanshaw of Ft. Lauderdale, Fla., Debbie (Hanshaw) Holasek and Andrew Hanshaw, both of San Diego, Calif.; and 19 great-grandchildren. Her parents; one son, Wallis Hanshaw; two brothers, Dan and Clarence Sanborn; and one sister, Anna Sanborn Marsh, are deceased. Mrs. Ahlvin attended and graduated from Kankakee District 111 schools. She attended Rockford College for two years and received a bachelor's degree from the University of Wisconsin in 1923. She was past president of the YWCA Board of Directors. Mrs. Ahlvin was a Uniformed Nurses' Aide at St. Mary's Hospital during World War II. She was a member of the DAR and Crusaders. She enjoyed playing bridge, needlepoint and spending time with her family. Services for Deborah Sanborn Ahlvin, 102, of Tucson, Ariz., formerly of Kankakee, were held Saturday (Oct. 2) at St. Paul's Episcopal Church in Kankakee. Mrs. Ahlvin died Sept. 24, 2004. Burial was in Kankakee Memorial Gardens. Pallbearers were John and David Hanshaw, Robert Lynch, William Sanborn and Luke and William Veronda. Obituary of A. Alan Hanshaw. 1930 census, 6th Ward, Kankakee, Kankakee County, Illinois; roll T626-526, ED 59, page 9A, line #5, dwelling #221, family #223. 1910 census, 3rd Ward, Beloit, Rock County, Wisconsin; roll T624-1735, ED 94, page 76A, line #7, dwelling #53, family #54. 1920 census, Beloit, Rock County, Wisconsin; roll T625-2013, ED 94, page 1A, line #29, dwelling #9, family #9. Obituary of Deborah Sanborn Hanshaw Ahlvin; "Tucson Citizen", Oct 8 2004: http://www.tucson.com.